All model nitro engines like the ones used in nitro RC helicopters are air cooled. They will have cooling fins around the cylinder body to dissipate heat, and the even more cooling fin surface area around the head. 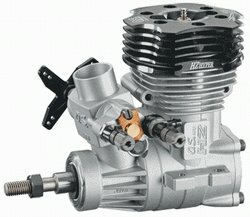 Especially on RC helicopter specific nitro engines as shown below. Nitro boat engines are the exception; most of them have water cooled heads. With planes and cars, there is almost always sufficient air flow around the engine to provide adequate cooling, but that is not the case with our RC helicopters. Our helicopter nitro engine is always nicely secured, safe and sound in the middle of the framed sections of the helicopter mechanics. There is very little air flow around this engine location and if you have a scale model that totally encloses the mechanics, there is next to no air movement. So how does our engine stay cool? Over and above the larger cooling fin surface area on the head of the engine, all nitro (and even gas) powered RC helicopters use small cooling fans. These fans are mounted directly to the output shaft of the engine. 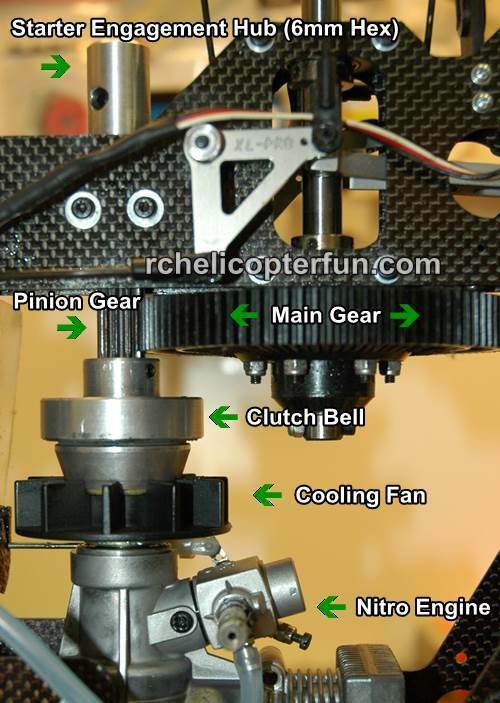 The photo above shows where the cooling fan is located in relation to the other nitro engine components in a typical nitro powered RC helicopter. Please note, the cooling shroud that goes around the fan to direct air flow over the engine cooling fins has been removed to see various parts better. The one issue to be aware of with cooling fans is they are vibration prone! These cooling fans are mounted directly to the engine output shaft and are therefore spinning at very high RPM’s – upwards of 18,000 in some cases. If the fan is even a little bit out of balance or not sitting square to the engine output shaft, this will cause harmful high frequency vibrations in your nitro RC helicopter. These vibrations if not corrected will shorten the life of your servos and radio equipment. They can also cause stress cracking on aluminum framed helicopters and wear out the bearings in the engine and clutch assembly quickly. The clutch ears can also develop cracks where they flex. Yep, first hand experience was my teacher before I understood just how destructive high frequency vibrations can be to an RC heli. A good indication if you have these vibrations is to watch the fuel in your fuel tank. If it foams up excessively you most likely have high frequency vibrations from the fan or starter shaft if your nitro RC helicopter uses that kind of starting system. An even better option these days is more and more FBL systems now also have vibration analysis data logging (using the 3 axis accelerometers inside the units as vibration measurement sensors). 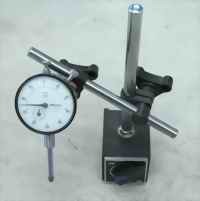 These units can really help identify unwanted / destructive vibration - very useful tools! I have also seen the horizontal stabilizer (if your heli has one) vibrate so fast it actually looks blurry. This is a good indication of fan issues as well. To ensure you have a vibration free fan, you should always check the balance and run-out of the fan assembly. 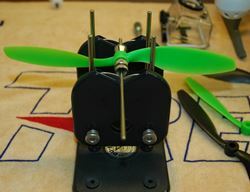 To check the balance you will need a good high point balancer such as shown here (checking the balance of a propeller, but the same exact method is used to check and balance a nitro heli cooling fan. This RC helicopter tool is indispensable and you will use it many times when building, checking, or repairing various rotating items on your RC helicopter (main rotor, tail rotor, fan). With your fan assembly in the balancer, watch and see if it rotates to a heavy spot. Mark the spot on the fan and turn it around on the balancer and perform the test again. If the fan rotates and settles with the heavy spot that you marked on the bottom again, you know for sure that is the heavy spot and the fan is definitely out of balance. You must now file or grind a little material off the fan at the heavy spot. Recheck the balance again. Continue doing this until the fan is perfectly balanced. Cooling fans today are generally very well balanced right out of the box, but they should still be checked. What is run-out you ask? A fan that is not sitting perfectly square and true on the engine output shaft will have run-out or “wobble”. To check for this you mount your fan on the engine shaft as per your manufactures instructions and then hold your engine gently but firmly in a bench vice or portable table vice. Caution here, just enough force to keep the engine from moving – the last thing you want to do is bend or crush the engine block. Now using a dial indicator with a magnetic base (another indispensable tool you will need if you are into nitro powered RC helicopters), you will measure any wobble in the fan. Place the dial indicator rod on the back face of the cooling fan as far out from the engine shaft as possible and rotate the fan. You should remove your glow plug in your engine – it will be much easier to turn with no compression build up. Now watch the dial movement on your dial indicator. It is best to turn the fan a bit and let go to get an accurate reading – do this at 90 degree intervals around the fan, the dial indicator should show less than 0.002 of an inch of run out, less than 0.001” is even better. If your run-out or wobble is more than that, simply remove the fan from the engine shaft, reposition the centering collet on the engine shaft, refit the fan, and recheck the run out. You may have to do this several times, but you should be able to get it under 0.002”. 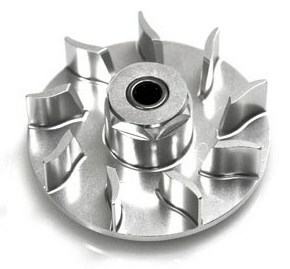 If you can’t, the fan may be bent, the collet may have been machined improperly, or the engine shaft is bent. With your dial indicator, you can check each item individually if required. These procedures are not just for newly built nitro RC helicopters – you should also check the run-out of the fan after a bad crash to make sure the fan or the engine shaft haven’t been bent. Fan balance shouldn’t change unless a piece of the cooling fan broke off – in that case you will need a new fan anyways and have to recheck the balance.